Keeping Up With the Joneses: Please! Somebody Go, and Melt Her! Last year, my bestest friend Nicole got tickets to see this highly acclaimed play that everybody is clamoring to see. If only the tickets weren't $200 a piece! They all cry. Well, for my birthday (last year), she gave me one of those tickets! I was so excited!!! Last night, she and I got all gussied up and went to dinner at the fancy restaurant known as The Garden Cafe at the Grand America Hotel. I told Nicole, "This place it too fancy for me!" She said, "Me, too!" I ordered the Poulet Roti. It's a roasted chicken with a Porchini Succotash. It was yummy. Then for dessert, I ordered the Chocolate Terrine. It was divine. The portion sizes were perfect. I didn't feel hungry after, but I was not overly stuffed, either. Perfect. Then we headed over to the Capital Theater for the main event. 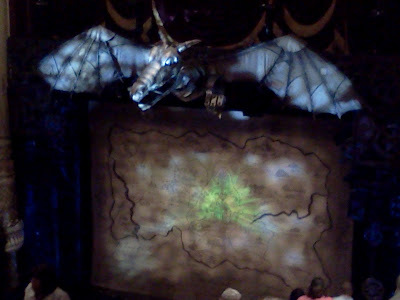 We got to see Wicked! I have wanted to see this show for a very long time. It doesn't really follow the book all that well, but I liked the adaptation, and the story. It was a really great show, and I do think it is worth the $200 ticket price. Especially if you want to see it done right. You know, before they allow community theatres to do abysmal productions of it. Not that that would happen here. Our community theaters are above par. My only complaint is that the lady playing Nessarose didn't have quite as strong a voice as the rest of the cast. She did really well, but her solo was a little lack-luster. She's also way more evil than Elphaba. Just sayin'. The set and the special effects were fantastic. I loved the portrayals of Glinda and Elphaba. Those two women can sing. I can only dream of singing like them one day. I guess I broke the rules and took a few pictures of the set before the show. I don't really see what the big deal is that I used my actual camera when everybody was using their phones to take pictures. How is that any different? It's not. They're lame. The end. So I took this picture with my phone, and posted it on facebook. Muwahahahaha!